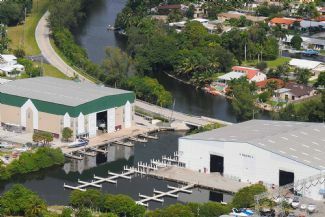 Fully enclosed secure dry storage facilities for boats up to *44'. Free use of in-water slips and work racks for our dry storage customers. 24-hour gated access, bottom rinse and engine flush on retrieval, non-ethanol fuel, and on-site service department. Located minutes from the Fort Lauderdale Airport with easy access to the ICW and Atlantic Ocean. Perfect for hurricane and seasonal storage. Rates start as low as $15/ft for dry storage. *Fixed bridge and size restrictions apply.